Concert # 1096 of The Never-Ending Tour. First concert of the 1999 US Summer Tour with Paul Simon. 1999 concert # 50. First concert with the 12th Never-Ending Tour Band: Bob Dylan (vocal & guitar), Charlie Sexton (guitar), Larry Campbell (guitar, mandolin, pedal steel guitar & electric slide guitar), Tony Garnier (bass), David Kemper (drums & percussion). 1–6, 13 acoustic with the band. 8, 14 Bob Dylan harmonica. 1, 4, 6, 13 Charlie Sexton and Larry Campbell backup vocal. 14-16 Paul Simon (vocal & acoustic guitar). 15, 16 Larry Campbell fiddle. We played that last song for everybody here who doesn’t know anybody. (after Rank Strangers To Me). Thank you, Ladies and Gentlemen! We have a very special guest. It's true! Alright! A very special guest. A true special guest! Mr. Paul Simon is here! Ha-ha.We’re gonna try to do this one. (before The Sound Of Silence). Warm up show without Paul Simon's band. Live debuts of Sound Of Silence, I Walk The Line and Blue Moon Of Kentucky. Session info updated 17 March 2014. Bob Dylan (vocal & acoustic guitar), Paul Simon (vocal & electric guitar), Mark Stewart (electric & acoustic guitar, dobro. Mandolin, cello), Vincent Nguini (electric guitar), Chris Botti (trumpet), Jay Ashby (slide trombone, percussion), Andy Snitzer (soprano saxophone, tenor saxophone, synthesizer), Tony Cedras (keyboards, accordion), Alain Mallet (keyboards), Bakithi Kumalo (bass), Jamey Haddad (percussion), Steve Shehan (percussion), Steve Gadd (drums). Concert # 1097 of The Never-Ending Tour. 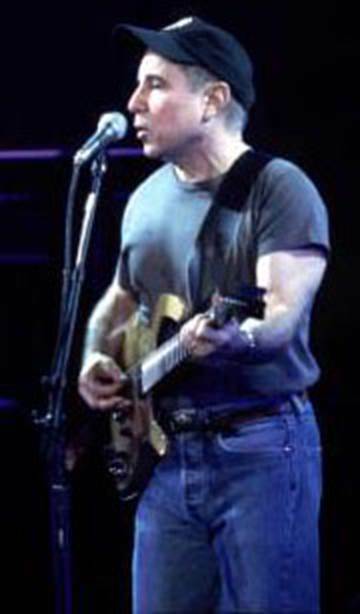 Second concert of the 1999 US Summer Tour with Paul Simon. 1999 concert # 51. Second concert with the 12th Never-Ending Tour Band: Bob Dylan (vocal & guitar), Charlie Sexton (guitar), Larry Campbell (guitar, mandolin, pedal steel guitar & electric slide guitar), Tony Garnier (bass), David Kemper (drums & percussion). 1–5, 13 acoustic with the band. 2, 13 Bob Dylan harmonica. Note. Paul Simon was the opening act. 7 new songs (50%) compared to previous concert. 7 new songs for this tour. Session info updated 14 November 2016. Concert # 1098 of The Never-Ending Tour. Third concert of the 1999 US Summer Tour with Paul Simon. 1999 concert # 52. Third concert with the 12th Never-Ending Tour Band: Bob Dylan (vocal & guitar), Charlie Sexton (guitar), Larry Campbell (guitar, mandolin, pedal steel guitar & electric slide guitar), Tony Garnier (bass), David Kemper (drums & percussion). 1–5, 13-16 acoustic with the band. 4, 7, 14 Bob Dylan harmonica. 1, 16 Charlie Sexton and Larry Campbell backup vocal. Note. Bob Dylan was the opening act. 8 new songs (47%) compared to previous concert. 5 new songs for this tour. Session info updated 23 January 2000. Concert # 1099 of The Never-Ending Tour. Concert # 4 of the 1999 US Summer Tour with Paul Simon. 1999 concert # 53. Concert # 4 with the 12th Never-Ending Tour Band: Bob Dylan (vocal & guitar), Charlie Sexton (guitar), Larry Campbell (guitar, mandolin, pedal steel guitar & electric slide guitar), Tony Garnier (bass), David Kemper (drums & percussion). 2, 5,7 Bob Dylan harmonica. Concert # 1100 of The Never-Ending Tour. Concert # 5 of the 1999 US Summer Tour with Paul Simon. 1999 concert # 54. Concert # 5 with the 12th Never-Ending Tour Band: Bob Dylan (vocal & guitar), Charlie Sexton (guitar), Larry Campbell (guitar, mandolin, pedal steel guitar & electric slide guitar), Tony Garnier (bass), David Kemper (drums & percussion). 2, 5, 13, 14 Bob Dylan harmonica. Bob Dylan was the opening act. Live debut of Hallelujah, I'm Ready To Go. Concert # 1101 of The Never-Ending Tour. Concert # 6 of the 1999 US Summer Tour with Paul Simon. 1999 concert # 55. Concert # 6 with the 12th Never-Ending Tour Band: Bob Dylan (vocal & guitar), Charlie Sexton (guitar), Larry Campbell (guitar, mandolin, pedal steel guitar & electric slide guitar), Tony Garnier (bass), David Kemper (drums & percussion). 2, 13, 14 Bob Dylan harmonica. Stereo audience recording, 16 minutes. Concert # 1102 of The Never-Ending Tour. Concert # 7 of the 1999 US Summer Tour with Paul Simon. 1999 concert # 56. Concert # 7 with the 12th Never-Ending Tour Band: Bob Dylan (vocal & guitar), Charlie Sexton (guitar), Larry Campbell (guitar, mandolin, pedal steel guitar & electric slide guitar), Tony Garnier (bass), David Kemper (drums & percussion). 1, 13, 14 Larry Campbell & Charlie Sexton (backup vocals). 3 new songs (21%) compared to previous concert. No new songs for this tour. Session info updated 6 September 2000. Concert # 1103 of The Never-Ending Tour. Concert # 8 of the 1999 US Summer Tour with Paul Simon. 1999 concert # 57. Concert # 8 with the 12th Never-Ending Tour Band: Bob Dylan (vocal & guitar), Charlie Sexton (guitar), Larry Campbell (guitar, mandolin, pedal steel guitar & electric slide guitar), Tony Garnier (bass), David Kemper (drums & percussion). 2, 6 Bob Dylan harmonica. 1, 4, 15, 16 Charlie Sexton and Larry Campbell backup vocal. I wanna say hello to all the ex-hippies tonight. I’ve never been a hippie myself but … I’m an honorary hippie! (before Blind Willie McTell). This was a breakout gig without Paul Simon. Live debut of Down Along The Cove. First Most Likely You Go Your Way since Albany 18 April 1997. Stereo audience recording, 15 minutes. Concert # 1104 of The Never-Ending Tour. Concert # 9 of the 1999 US Summer Tour with Paul Simon. 1999 concert # 58. Concert # 9 with the 12th Never-Ending Tour Band: Bob Dylan (vocal & guitar), Charlie Sexton (guitar), Larry Campbell (guitar, mandolin, pedal steel guitar & electric slide guitar), Tony Garnier (bass), David Kemper (drums & percussion). 2, 3, 13 Bob Dylan harmonica. 1, 14 Charlie Sexton and Larry Campbell backup vocal. 7 Larry Campbell pedal steel guitar. 7 new songs (50%) compared to previous concert. 1 new song for this tour. Concert # 1105 of The Never-Ending Tour. Concert # 10 of the 1999 US Summer Tour with Paul Simon. 1999 concert # 59. Concert # 10 with the 12th Never-Ending Tour Band: Bob Dylan (vocal & guitar), Charlie Sexton (guitar), Larry Campbell (guitar, mandolin, pedal steel guitar & electric slide guitar), Tony Garnier (bass), David Kemper (drums & percussion). 1–5, 12-15 acoustic with the band. 2, 4, 12, 13 Bob Dylan harmonica. 2 Larry Campbell pedal steel guitar. 13-15 Paul Simon (vocal & acoustic guitar). Thank you, ladies and gentlemen. I wanna introduce my band to you right now, some of the finest players in the country. On the guitar, Larry Campbell, he also plays steel guitar. Charlie Sexton is on the rhythm guitar. On the drums tonight is David Kemper, David Kemper's on the drums. And Tony Garnier is on the bass guitar. 1 Bob Dylan (vocal, harmonica & acoustic guitar), Paul Simon (vocal & electric guitar), Larry Campbell (mandolin, fiddle), Vincent Nguini (electric guitar), Bakithi Kumalo (bass), Jamey Haddad (percussion), Steve Shehan (percussion), Steve Gadd (drums). 2-3 Bob Dylan (vocal & acoustic guitar), Paul Simon (vocal & electric guitar), Mark Stewart (electric & acoustic guitar, dobro. Mandolin, cello), Vincent Nguini (electric guitar), Chris Botti (trumpet), Jay Ashby (slide trombone, percussion), Andy Snitzer (soprano saxophone, tenor saxophone, synthesizer), Tony Cedras (keyboards, accordion), Alain Mallet (keyboards), Bakithi Kumalo (bass), Jamey Haddad (percussion), Steve Shehan (percussion), Steve Gadd (drums). Ladies and gentlemen, it is a spirit, an honor and a joy for me to share these evenings and the stage with Bob Dylan. Session info updated 24 March 2014. Concert # 1106 of The Never-Ending Tour. Concert # 11 of the 1999 US Summer Tour with Paul Simon. 1999 concert # 60. Concert # 11 with the 12th Never-Ending Tour Band: Bob Dylan (vocal & guitar), Charlie Sexton (guitar), Larry Campbell (guitar, mandolin, pedal steel guitar & electric slide guitar), Tony Garnier (bass), David Kemper (drums & percussion). 2, 5, 13 Bob Dylan harmonica. 4 Larry Campbell pedal steel guitar. That was one of my love songs. Well, they’re all love songs. We love to play them all! (after Love Sick). Concert # 1107 of The Never-Ending Tour. Concert # 12 of the 1999 US Summer Tour with Paul Simon. 1999 concert # 61. Concert # 12 with the 12th Never-Ending Tour Band: Bob Dylan (vocal & guitar), Charlie Sexton (guitar), Larry Campbell (guitar, mandolin, pedal steel guitar & electric slide guitar), Tony Garnier (bass), David Kemper (drums & percussion). 1–5, 13-15 acoustic with the band. 5, 13 Bob Dylan harmonica. 5 new songs (31%) compared to previous concert. No new songs for this tour. Session info updated 4 July 2013. Stereo audience recording, 17 minutes. Concert # 1108 of The Never-Ending Tour. Concert # 13 of the 1999 US Summer Tour with Paul Simon. 1999 concert # 62. Concert # 13 with the 12th Never-Ending Tour Band: Bob Dylan (vocal & guitar), Charlie Sexton (guitar), Larry Campbell (guitar, mandolin, pedal steel guitar & electric slide guitar), Tony Garnier (bass), David Kemper (drums & percussion). 1–5 acoustic with the band. 2, 5 Bob Dylan harmonica. 1, 13 Charlie Sexton and Larry Campbell backup vocal. Almost didn’t get here tonight. Had a flat tire, there was a fork in the road! (before Just Like A Woman). 1 new song (7%) compared to previous concert. No new songs for this tour. Concert # 1109 of The Never-Ending Tour. Concert # 14 of the 1999 US Summer Tour with Paul Simon. 1999 concert # 63. Concert # 14 with the 12th Never-Ending Tour Band: Bob Dylan (vocal & guitar), Charlie Sexton (guitar), Larry Campbell (guitar, mandolin, pedal steel guitar & electric slide guitar), Tony Garnier (bass), David Kemper (drums & percussion). 1–4, 11-14 acoustic with the band. 1, 14 Larry Campbell & Charlie Sexton (backup vocals). 2–4, 11, 12 Bob Dylan harmonica. 2, 13 Larry Campbell fiddle. All right, we’re awfully tired, we slept all night in a trailer park. Yeah, we had to be really quiet, we didn’t want to wake up the sleeping bags. (after Highlands). 11 new songs (73%) compared to previous concert. 3 new songs for this tour. Concert # 1110 of The Never-Ending Tour. Concert # 15 of the 1999 US Summer Tour with Paul Simon. 1999 concert # 64. Concert # 15 with the 12th Never-Ending Tour Band: Bob Dylan (vocal & guitar), Charlie Sexton (guitar), Larry Campbell (guitar, mandolin, pedal steel guitar & electric slide guitar), Tony Garnier (bass), David Kemper (drums & percussion). 1–5, 12 acoustic with the band. 2, 4, 5 Bob Dylan harmonica. Paul Simon was the opening act. They started to play the opening chords to Highlands before switching to All Along The Watchtower. Concert # 1111 of The Never-Ending Tour. Concert # 16 of the 1999 US Summer Tour with Paul Simon. 1999 concert # 65. Concert # 16 with the 12th Never-Ending Tour Band: Bob Dylan (vocal & guitar), Charlie Sexton (guitar), Larry Campbell (guitar, mandolin, pedal steel guitar & electric slide guitar), Tony Garnier (bass), David Kemper (drums & percussion). 2, 12, 13 Bob Dylan harmonica. 1, 15 Charlie Sexton and Larry Campbell backup vocal. That was a song about water. I had to play that. I was talkin’ to Neil Young yesterday actually. He said “there’s no cool music”. I said “Neil, put your radio in the refrigerator”. (after Watching The River Flow). 9 new songs (56%) compared to previous concert. 2 new songs for this tour. 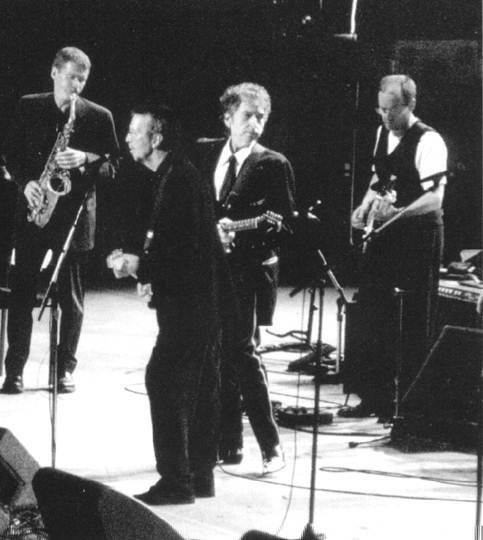 Bob Dylan (vocal & guitar), Eric Clapton (guitar), Andy Fairweather Low (guitar), Nathan East (bass), Tim Carmon (keyboards), Steve Gadd (drums). 2 David Sanborn (alto saxophone). 3, 6, 7 Eric Clapton (vocal & guitar). 6, 7 Katie Kissoon (backing vocals), Tessa Niles (backing vocals). 7 Sheryl Crow (vocal & accordion). Stereo audience recording, 45 minutes. Session info updated 3 March 2011. 1 Bob Dylan (vocal, acoustic guitar & Harmonica), Paul Simon (vocal & electric guitar), Bakithi Kumalo (bass), Steve Gadd (drums). 2 Bob Dylan (vocal & acoustic guitar), Paul Simon (vocal & electric guitar), Vincent Nguini (electric guitar), Larry Campbell, Bakithi Kumalo (bass), Steve Gadd (drums). 3 Bob Dylan (vocal & acoustic guitar), Paul Simon (vocal & electric guitar), Mark Stewart (electric & acoustic guitar, dobro. Mandolin, cello), Vincent Nguini (electric guitar), Chris Botti (trumpet), Jay Ashby (slide trombone, percussion), Andy Snitzer (soprano saxophone, tenor saxophone, synthesizer), Tony Cedras (keyboards, accordion), Alain Mallet (keyboards), Bakithi Kumalo (bass), Jamey Haddad (percussion), Steve Shehan (percussion), Steve Gadd (drums). Thank you, ladies and gentlemen! I wanna introduce my band to you right now, some of the finest players in the country, that's for sure. On the drums, David Kemper! Charlie Sexton's on the guitar playing here. Larry Campbell's playing the guitar over there. On bass guitar tonight is Tony Garnier.We gotta get out of here now, we gotta get a hammer and hit the sack! (after Not Dark Yet). Paul Simon sings lines from Mother And Child Reunion during The Sound Of Silence. Concert # 1112 of The Never-Ending Tour. Concert # 17 of the 1999 US Summer Tour with Paul Simon. 1999 concert # 66. Concert # 17 with the 12th Never-Ending Tour Band: Bob Dylan (vocal & guitar), Charlie Sexton (guitar), Larry Campbell (guitar, mandolin, pedal steel guitar & electric slide guitar), Tony Garnier (bass), David Kemper (drums & percussion). 2, 5, 12 Bob Dylan harmonica. We gotta get out of here now, we gotta get a hammer and hit the sack! (during band intro before Highway 61 Revisited). 4 new songs (30%) compared to previous concert. No new songs for this tour. Note. Paul Simon sings lines from Mother And Child Reunion during The Sound Of Silence. Concert # 1113 of The Never-Ending Tour. Concert # 18 of the 1999 US Summer Tour with Paul Simon. 1999 concert # 67. Concert # 18 with the 12th Never-Ending Tour Band: Bob Dylan (vocal & guitar), Charlie Sexton (guitar), Larry Campbell (guitar, mandolin, pedal steel guitar & electric slide guitar), Tony Garnier (bass), David Kemper (drums & percussion). 1, 12, 13 Charlie Sexton and Larry Campbell backup vocal. Thank you, Ladies and Gentlemen! I was born right up on the hill there. I'm so happy to see that's it's still there. Alright. My first girlfriend came from here. Yeah. She was so conceited I used to call her Mimi. [drum roll] She still lives up there, too. (after Tryin' to Get to Heaven). 5 new songs (38%) compared to previous concert. No new songs for this tour. Concert # 1114 of The Never-Ending Tour. Concert # 19 of the 1999 US Summer Tour with Paul Simon. 1999 concert # 68. Concert # 19 with the 12th Never-Ending Tour Band: Bob Dylan (vocal & guitar), Charlie Sexton (guitar), Larry Campbell (guitar, mandolin, pedal steel guitar & electric slide guitar), Tony Garnier (bass), David Kemper (drums & percussion). 1, 11, 15 Larry Campbell & Charlie Sexton (backup vocals). I always like to play in Milwaukee, um .., one of my, um …, one of my first, …. , one of my first girl friends was from Milwaukee, she was an artist. [audience cheers] Yeah, that’s right! She gave me the brush off. (before band intro after Make You Feel My Love). Live debuts of both That'll Be The Day and The Wanderer. Concert # 1115 of The Never-Ending Tour. Concert # 20 of the 1999 US Summer Tour with Paul Simon. 1999 concert # 69. Concert # 20 with the 12th Never-Ending Tour Band: Bob Dylan (vocal & guitar), Charlie Sexton (guitar), Larry Campbell (guitar, mandolin, pedal steel guitar & electric slide guitar), Tony Garnier (bass), David Kemper (drums & percussion). 1, 3, 7, 16 Charlie Sexton and Larry Campbell backup vocal. I thought I’d go to the Motown Museum today <audience cheers> Yeah! Yeah. I was looking for all the, you know all the Smokey Robinson stuff. I asked the guy where all the Smokey Robinson stuff was. “I don’t know”, he said, “but you know, ah, you know what happens to Clark Kent when he gets hungry?” I said “What?? ?” He said “He turns into Supperman”. I said “I still want to know where all the Smokey Robinson stuff is”. (after Silvio). Note. This was a breakout gig without Paul Simon. 14 new songs (87%) compared to previous concert. 6 new songs for this tour. Concert # 1116 of The Never-Ending Tour. Concert # 21 of the 1999 US Summer Tour with Paul Simon. 1999 concert # 70. Concert # 21 with the 12th Never-Ending Tour Band: Bob Dylan (vocal & guitar), Charlie Sexton (guitar), Larry Campbell (guitar, mandolin, pedal steel guitar & electric slide guitar), Tony Garnier (bass), David Kemper (drums & percussion). 1, 12, 15 Charlie Sexton and Larry Campbell backup vocal. I had to play that because there’s a country singer here, my buddy Garth Brooks. Just couldn’t get out of here without playing it. (after Make You Feel My Love). 12 new songs (75%) compared to previous concert. 2 new songs for this tour. Concert # 1117 of The Never-Ending Tour. Concert # 22 of the 1999 US Summer Tour with Paul Simon. 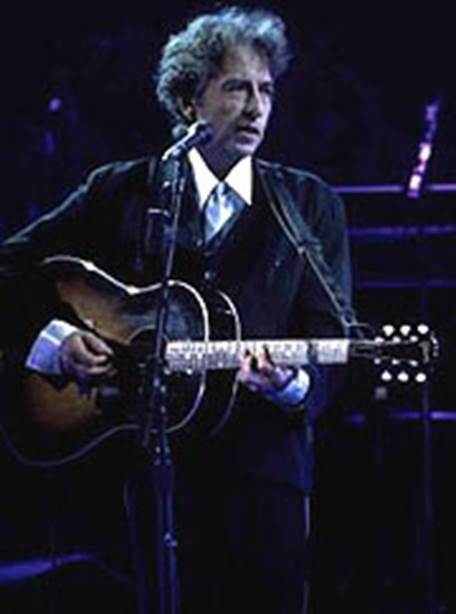 1999 concert # 71. Concert # 22 with the 12th Never-Ending Tour Band: Bob Dylan (vocal & guitar), Charlie Sexton (guitar), Larry Campbell (guitar, mandolin, pedal steel guitar & electric slide guitar), Tony Garnier (bass), David Kemper (drums & percussion). 1–5, 12, 15 acoustic with the band. 2, 5, 12, 14 Bob Dylan harmonica. 4, 7 Larry Campbell pedal steel guitar. Session info updated 1 February 2010.